“With the way Morris was pitching, there was no room for error. Unfortunately he made a mistake to the wrong guy Ken Griffey," said Boston manager Terry Francona on Matt Morris' performance on June 20, 2004. Griffey led off the sixth inning and crushed Morris' 2-2 fast ball deep into the right field stands as his Reds defeated the Cardinals, 6-0, at Busch Stadium. After the game Morris said “No comment,” but his body language said it all to a worldwide audience. 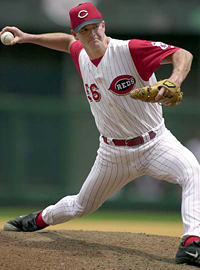 "This whole year has been a bad dream," observed Cincinnati Reds’ Pitcher Scott Sullivan after giving up Sammy Sosa’s 500th career home run on April 4th 2003 at Cincinnati's Great American Ball Park. Sosa's historic homer was his fourth served up by Sullivan, and came on a knee high fastball delivered by the Reds’ reliever in the top of the seventh inning. Sosa got all of it and ripped it over the right-center field wall. On September 13, 1971: Frank Robinson of the Orioles homered in each game of a doubleheader split with Detroit, becoming the 11th member of the 500-HR club with his 2nd shot. Jim Bouton wrote in Ball Four: I was warming up in the bullpen when a fan leaned out and said, "Hey Jim, how do you pitch to Frank Robinson?" I told him the truth. "Reluctantly," I said. Mark McGwire became the sixteenth player in history to reach five hundred when he sent Andy Ashby's 1-1 breaking ball four-hundred and fifty-one feet over the center field fence! Andy Ashby gave up one more home run to Mark McGwire then said after the game, "Well, I gave up five-hundred, so I may as well give up five-hundred and one, too!"